The Bluebird Cafe has a unique weekly writers' night to showcase up-and-coming talent to a packed room. According to the Bluebird's website, a hit Nashville songwriter closes out the night with a special performance. In order for artists to perform, though, they can't just sign up like the open mic nights the venue holds on Mondays – they have to pass an audition. These auditions are held quarterly. Auditioning songwriters play in front of a panel of judges (composed of music industry professionals). If the songwriter passes the audition, they're then eligible to play a three-song slot on a Sunday Writers' Night. After a songwriter plays at least four Sunday Writers' Nights, they can then be considered for their own early show round. Once you're onstage at a Sunday Writers' Night, you have the crowd's undivided attention. The evening is designed specifically for an array of talented songwriters to perform for a large, attentive, and responsive audience. Not many people know this, but in 2008, the original owner and founder Amy Kurland sold the Bluebird Cafe to the Nashville Songwriters Association International. NSAI is a 40-plus-year-old, not-for-profit organization devoted to the service of songwriters and the craft of songwriting. Kurland believed in NSAI's mission to "educate, elevate, and celebrate songwriters" as an opportunity to champion Bluebird's relationship to songwriters and the community. 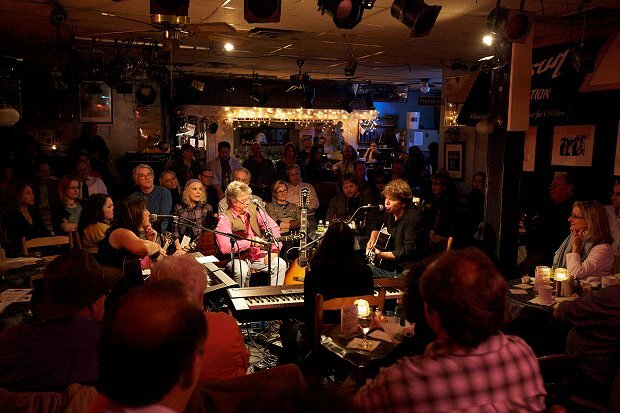 The Bluebird Cafe is famous for "in-the-round" shows in which performers set up on the floor facing each other, and the stage is filled with tables where patrons sit. This intimate setup creates a unique experience where, if a songwriter turns all the way around with his or her guitar, he or she might knock someone's drink off of a table! This creates a vulnerable environment for performers that, in turn, gives the audience an up-close and personal view of the musicians performing. The venue is small, but in a way that doesn't come off as cramped. With the lack of space, it utilizes all of the stage and open area for an audience to attend. Even when big musicians come, they don't have a green room to hang away from the crowd. This venue keeps everyone close – the performers, audience, and crew. It's a unique environment with one of the most intimate settings of any venue. At the Bluebird, musicians are equal. There's always a line to get into the venue, whether it's for a big name or an aspiring artist in the local area. Several small artists made a name for themselves at Bluebird. Kathy Mattea was the first star to be identified with the Bluebird, and she's now a regular guest performer. Garth Brooks played on both the open mic and Sunday songwriters' shows before he was discovered and signed to Capitol Records. The Bluebird sets the stage for successful musicians, and they always come back. One of the things that makes the Bluebird Cafe special is that when you're working with the staff, they understand what it means to be an aspiring songwriter. And if they're budding to be the next Bob Dylan, they're involved in the music industry and the songwriting community. You're surrounded by people who have a genuine passion for music and songwriting, and their help is exceptional for that very reason. Open mics can be iffy – most musicians know that already – but at the Bluebird Cafe, you're not only working with professional, passionate musicians, you're working with well-established musicians in the Nashville music scene. So if you make a good impression, yes, you're winning over the audience, but you're also networking with people who are already in the industry. The Bluebird puts a unique emphasis on songwriting. Its staff isn't worried about who's the best frontman or frontwoman; they're looking for quality material that will connect with their audience and history. It's a place that values thoughtful lyrics, catchy melodies, and good craft. It's not looking to expand into a big arena; rather, the staff wants to stay at an intimate level and continue to push aspiring songwriters into the big lights. Are you ready for your big moment at the legendary Bluebird Cafe? Four solo acoustic Sonicbids artists will be chosen for a once-in-a-lifetime gig. Make sure your songwriting portfolio is raring to go (no cover songs allowed!) and be sure to apply for free by June 19. Good luck!